Following up on October’s ADE party at AIR, Luke Solomon heads back to Amsterdam for Classic Music Company’s first show in a good long while. 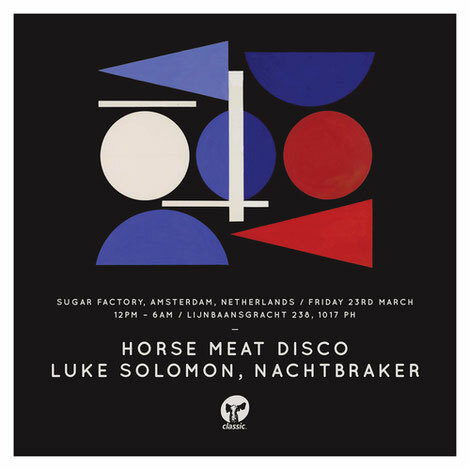 Classic X Amsterdam on Friday, 23 March will feature Classic family old and new – joining Luke will be the Horse Meat Disco crew and local beats act Nachtbraker at Amsterdam’s cultural hotspot, Sugarfactory. Classic’s musical spirit is ‘weird and wonderful, original and bonkers with plenty of dancefloor heat and insanely infectious basslines’. The man responsible for sharing Classic’s left-of-centre house selections with the world, Luke Solomon is usually busy in the studio with London collective Horse Meat Disco so bringing them along was a no-brainer. Aiming to be champions for disenfranchised club citizens everywhere, Horse Meat Disco combine house classics and oddities, nailing Classic’s wonky take on disco. Warming things up at Sugarfactory will be Nachtbraker, who Luke has been supporting on his Business As Usual radio show for some time, appearing as a special guest and is a possible one to watch. The first of three planned events for 2018, Classic Music Company is ready to get back on the road this year aiming to bring the music back to where it belongs - on the dancefloor.